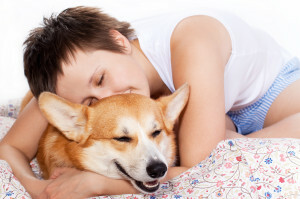 The Pembroke Welsh Corgi is an excellent companion dog. His gentle and easy-to-care-for nature makes him a perfect pet. Corgis are remarkably adaptable dogs who seem to do as well with apartment living as they do out on the farm. They do need supervised play and should never be allowed to roam loose. Corgis have often been called a “big dog in a little package.” The Pembroke Welsh Corgi is an extremely intelligent animal who learns quickly and retains knowledge very well. 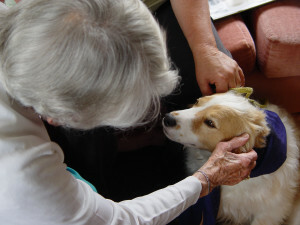 Training (of you and the dog) is always ongoing and must be done in a positive manner. From a very early age, the Corgis’ intense curiosity expresses itself. Every corgi needs positive direction to channel this curiosity so that he becomes an asset to the canine community. Pembroke Welsh Corgis were bred to “do a job.” The job was that of all around farm dog. These dogs needed to be able to face down a 2700 lb. bull, herd a group of sheep, provide organic rodent control, be a family companion, and guard the family farm. The modern Pembroke retains these traits and they are evident in the personality and habits you will find in a well bred Pembroke Welsh Corgi. 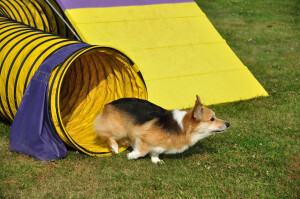 Like most working breeds, Corgis tend to be active dogs and need regular exercise. These dogs are not wilting flowers, they are brave and outgoing. There is no such thing as a stranger, just a friend they haven’t met yet. They may also have a bit of a prey drive, so they should be carefully supervised around small animals. That isn’t to say they can’t live with small animals, you just have to be careful. Many homes have both cats and Pems. They love being a part of a family and want to be with you at all times. Please don’t get a Pembroke, or any dog, if you do not expect it to be a fully integrated member of your family. Dogs are pack animals and there is no better way to make them suffer than to leave them in a kennel in the backyard. The role of protector also makes them prone to bark. Corgis are intelligent and can be trained to curtail this habit, but you have to make a conscious effort to teach them when they need to be quiet. Corgis excel in many areas including therapy dog work, herding competitions, agility, tracking, and obedience.